To be able to build the perfect stable, you need to prepare for it. There’s no other way of going about it. Yes, whether you’re a big breeder with 100 horses or own just one horse, you need to have the right plan for building your stable. This will make your structure more efficient and more cost-effective at the same time. 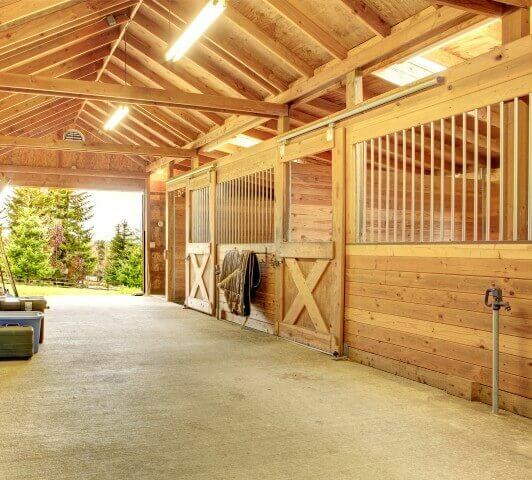 If you’re building a barn or a stable, it would be important to look into its location or position. Why? This will give you an idea as to the specific features or style that will work best with your structure. For example: will your stable be located in a watery area? If so, then you will need to build a structure with the proper drainage characteristics. Does the area have a good breeze and a lot of trees? In that case, you should opt for a stable design that can take advantage of them. Keeping your horses in stables that don’t have the needed safety features may cause undue injury. And of course, that can be a big problem for you. As it is, you should try to find ways to make your stable a lot safer for your horses. Opt for stable designs that do not make use of any sharp edges. Keep fire hazards at bay, and as much as possible, utilise methods that can help prevent potential diseases. Another thing worth noting when it comes to stables is: ventilation. Keep your structure well-ventilated as this can help protect your horse from respiratory problems due to odours, dusts and germs. This can also prevent other health issues. Remember the rule: the better your materials are, the better your structure will be. As it is, you should only opt for materials that are durable and long lasting. This will make your structure more usable, which in turn, can mean even more benefits for you in the long run. In other words: prioritise on quality and not on price alone. Are you looking for high-quality stables for your Perth property? Call 1300 778 628.